Continuing a habit that begun last month, on Wednesdays we will introduce concepts and topics related to the energy markets. The topic on focus this time, will be discussed in four parts and is a favorite topic of ours: Energy Self-Consumption. 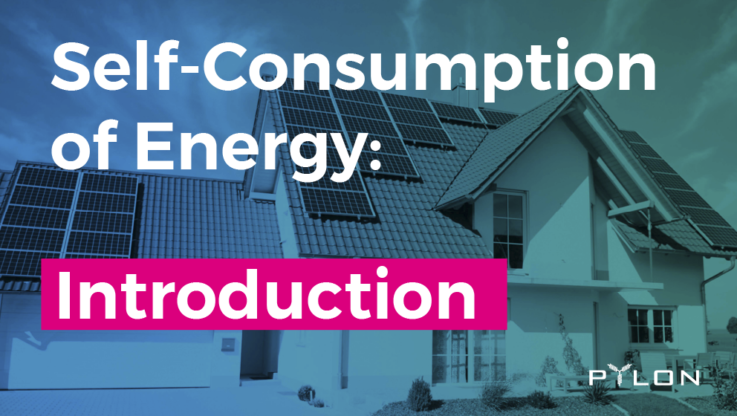 Part 1 – Energy Self-consumption: Introduction. Part 2 – Energy Self-consumption: Current state legislation and Types of self-consumers connected to the network. Part 3 – Energy Self-consumption: Domestic. Part 4 – Energy Self-consumption: Industrial. Self-consumption can be simply defined as the consumption of goods and services by the same person/organisation that was produced. We can find examples of self-consumption in a big range of areas and sectors – agriculture, livestock… However, the one we are going to look into will be the energy sector – what else?! Energy self-consumption consists of covering all or part of our energy consumption with energy that we produce ourselves (i.e. source=sink). The self-consumption facilities can be isolated (without physical connection to the network – outside the electrical system) or connected to the network (prosumers – belong to the electrical system). In isolated installations, since there is no physical connection to the network, all the electricity consumption has to be supplied within the generation facility, while, in those connected to the network, what is intended is to supply part of the electricity consumption and , therefore, acquire a smaller amount from the grid, reducing the electric bill. Isolated installations are not usually carried out when there is access to the electricity grid, although with the decrease in prices of recent years in photovoltaic modules and batteries, they are starting to become more competitive. In the second part of the post, next week, we will talk about the development of these prices. In the case of self-consumption facilities that are connected to the network, mostly associated with photovoltaic technology, the objective is to reduce the dependence from the network, taking advantage of the electricity produced by solar radiation. In that way, consumers are transformed to the so-called ‘prosumers’ and can reduce their electricity bill with the solar energy that they are self-generating. These facilities are much cheaper than isolated ones, as they do not necessarily include energy storage or auxiliary generation. They are still connected to the network, using it to complement the (lack of) solar generation – supply during nights or on cloudy days. It is important to properly dimension an installation so that it can cover the real energy needs of the end-user in order to minimize the excess generated energy, which in most cases goes to “waste” – the surplus energy generated from these facilities is not currently not monetized (e.g. in Spain). 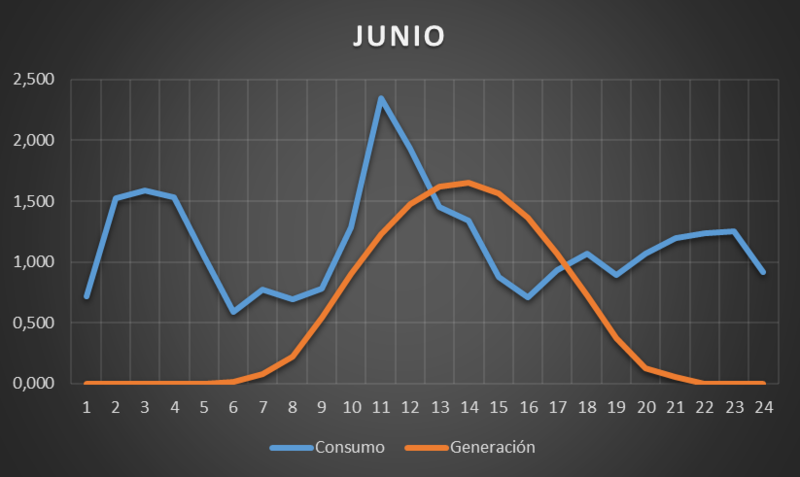 The graph below shows an example of electrical consumption and generation of a domestic PV installation, for one day (24 hours) of June, in Spain. The user in this example, who has a small installation of ~2 kWp in solar panels, covers the period of domestic consumption between 9:00 in the morning and 18:00 in the afternoon. There is a period between 9:00 and 13:00 where he/she needs a little more energy in addition to the one produced by the installation and you would support consuming the network; between 13:00 and 18:00 more energy is generated than consumed, resulting in a surplus energy. These surpluses, due to the current legal limitations that exist in Spain that we will explore further on in the second part of the post, cannot be utilized by third parties (e.g. sold directly to a neighbor) and are not paid by the market. In other words, the energy market does not recognize the value of Distributed Energy Resources (DER) within the energy markets and electrical grid. It is clear that we have a problem and that it affects the self-consumers by excluding them from the operation of the current energy market – being connected to the same network. There is a lack of communication between these actors and the rest of the energy market players that prevents the optimization and utilization of these decentralized renewable generation facilities “DERs”. Pylon Network platform came out of this need and has been designed to cover this gap. Pylon Network is a tool that empowers self-consumers – the end user – and offers them access to the energy market. This platform transforms DER facilities into digital assets of the system, opening new exploitation opportunities, allowing them to obtain additional revenues by offering market flexibility services, such as demand control and network balancing. RD 900/2015 is the document that regulates self-consumption in Spain. In the second part of the post we will explain its peculiarities, we will define the well-known “sun tax”, seeing who is affected and who is not, as well as its future development and we will talk about the prices and procedures required for a typical installation of self-consumption. So, be patient until next week when you will have a good overview of all the aspects around self-consumption (in Spain). We hope that by then you will have all necessary information to start your trip of self-consumption.